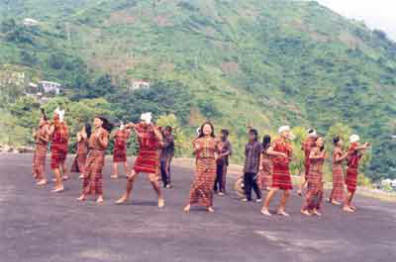 The Solakia dance is prevalent in Mizoram. ‘So’ literally means unnatural death, but in the context of this dance it means the severed head of an enemy. ‘La’ means dance and ‘Kia’ refers to that which has been done with better understanding and knowledge. Originally, Solakia was danced to celebrate the victory over enemies, especially when the head of an enemy is brought home as a trophy by the victor. Now, it is performed on all important occasions. Although at present it is performed by men and women of all Mizo communities, it is believed to have originated by the Piwi and Lakher communities. The vocal music that accompanies the dance is closer to chanting than singing. Percussion music is provided by a pair of gongs, one bigger than the other, are called Darkhuang. Several pairs of cymbals are also played to enhance the music.